Street Plans is working with America Walks to lead a Webinar as part of the organization’s “Tools for the Field” series. The webinar will explore the role that Tactical Urbanism can play in creating communities that promote enjoyable and accessible physical activity. Sound interesting? Join us for the webinar! Photo: Pilot curb extension in Hamilton, ON, created following Tactical Urbanism Workshop by Street Plans. Image by Jason Leach. Last night, 220 people joined us at the North Beach Charrette! The event kicked off with a presentation on town planning & community revitalization. Following the presentation, attendees worked alongside their neighbors to draw their vision for the future of North Beach. Street Plans was excited to participate as the lead transportation consultant throughout the Charrette. Click here for event and project info. 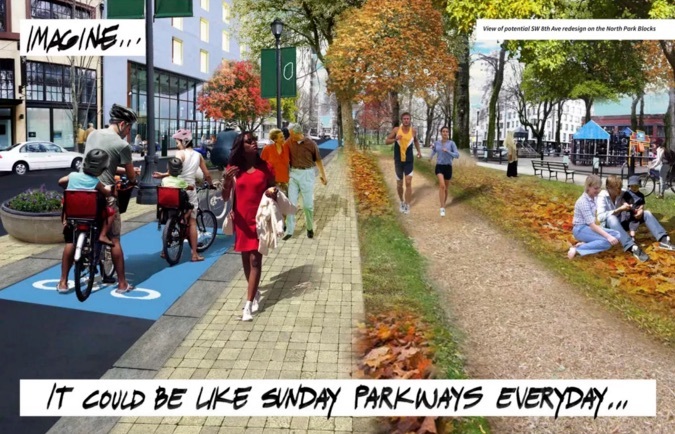 Portland has announced a competition to design the six-mile carless pathway known as Green Loop, a proposal in the city’s 2035 Central City Plan. The winner of the competition will be awarded a $20,000 grant at this April’s Design Week Portland. Street Plans Principal Mike Lydon will jury the competition and help select the winner.